THE DEPARTMENT of Work and Pensions last week, after years of prevarication, published the figures on the numbers of disability benefit claimants who have died shortly after having been found “fit for work” by a Government Work Capability Assessment (WCA). 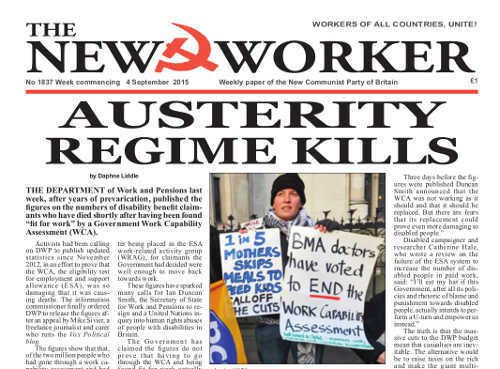 Activists had been calling on DWP to publish updated statistics since November 2012, in an effort to prove that the WCA, the eligibility test for employment and support allowance (ESA), was so damaging that it was causing deaths. The information commissioner finally ordered DWP to release the figures after an appeal by Mike Sivier, a freelance journalist and carer who runs the Vox Political blog. The figures show that that, of the two million people who had gone through a work capability assessment and had received an ESA decision between 1st May 2010 and 28th Feb 2013, nearly 41,000 had died within a year of that decision. The reports also show that between December 2011 and February 2014, 81,140 people died while claiming ESA or incapacity benefit (IB). And 2,650 ESA and Invalidity Benefit claimants died soon after being found “fit for work” as a result of an assessment. CHANCELLOR George Osborne took advantage of the bank-holiday weekend to launch his announcement for a £500 million upgrade for the Royal Navy base at Faslane in Scotland — “to make it ready for the replacement for the Trident weapons system”. Scottish First Minister Nicola Sturgeon attacked this “arrogant decision” when MPs in Westminster will not vote on the Trident replacement until next year. But he warned the political consensus that Britain needed a nuclear deterrent “risks being shattered again by an unholy alliance of Labour’s left-wing insurgents and the Scottish nationalists”. THE RIGHT-WING Labour leadership is now in the throes of full blown panic and trying to rewrite its own constitution while in the middle of its leadership election as it begins to dawn on the leaders just how fragile their hold on the party is once the masses of the working class in Britain has been given the chance to take it back into working class control. The Labour Party has always been a mass party encompassing a very wide political spectrum, and although in theory a democratic centralist party it has always tolerated factions. Every now and again it would purge its left and Trotskyite enterists. Harold Wilson when Prime Minister was regarded as right-wing by the youth of the Labour Party. Nevertheless he was left-wing and pro-trade union enough to raise concerns within the ruling class — who regarded him as a puppet of Moscow — and there were serious plots to discredit and undermine his government. They were especially worried when he was re-elected after the mid-70s miners’ strike brought down the Edward Heath government.